Exalto Bearings is using a number of Universal ‘Snap’ Gauges from Bowers Group to measure marine bearings. Based in Derby, Exalto Bearings is a specialist in the CNC turning and milling of high end precision components, manufacturing high quality, rubber lined and composite cutlass bearings for the pump and marine industries. The Bowers Group Universal ‘Snap’ Gauges are used for the precise measurement of interior diameters, outer diameters, and lengths; ensuring concentricity and parallelism of components with exceptionally tight tolerances. The use of the snap gauges has not only improved the quality of Exalto’s bearings, the efficiency of the inspection department has also increased dramatically. After a request from a customer involving the manufacture of bearings to a tighter tolerance than Exalto Bearings’ usual specification of +/- 0.025mm, a review of the company’s quality procedures was prompted. The measurement for the outer diameter was critical to the customer, therefore an exceptionally accurate and repeatable method of measurement was required. Exalto Bearings, therefore, needed to be able to maintain the specification bands without any deviation whatsoever. 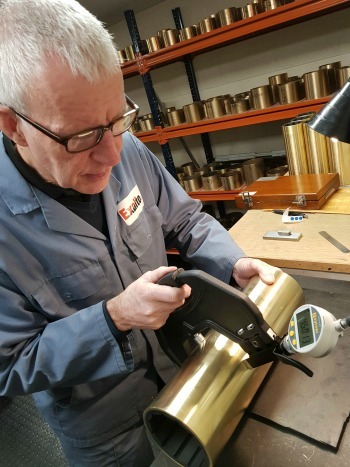 After visiting the premises of the new customer, Business Manager at Exalto Bearings, Mark Chesher, observed the use of ‘Snap’ gauges as a method of inspecting the diameters of the bearings. Naturally, Mark was interested to find more out about these precision gauges and the benefits that they could bring to the business. 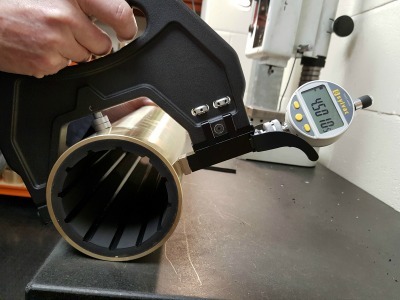 Exalto Bearings contacted Bowers Group to discuss its measurement requirements, resulting in the company buying 6 Bowers Universal ‘Snap’ Gauges appropriate for measuring bearings 50–150mm in diameter. The Bowers Universal ‘Snap’ Gauges have been specially designed for the quick, reliable and accurate measurement of external cylindrical diameters. Exalto Bearings uses the snap gauges to measure the outer diameter and parallelism of its marine bearings, therefore improving the accuracy of the components by eliminating the possibility of human error in measurement. In turn, the quality of the manufactured bearings is improved, as well as the efficiency of its inspection department. Bowers Universal ‘Snap’ Gauges are particularly suitable for use in series production. The instrument is tough and solid enough to use on the machine in the workshop, and flexible enough to be used in the measuring room for sample and final measurements. The measuring surfaces are made from top-quality tungsten carbide mounted on a no-maintenance spring-operated mechanism. Mark Chesher continued: “The gauges make inspection quicker by enabling us to measure the whole bearing in one operation while also supplying us with a confident measurement the first-time round. There is no need to re-check, and there is no risk of discrepancy in readings between inspectors. They are also easy to use; requiring minimum training and enabling the operator to easily switch between metric and imperial measuring systems without re-setting. This is a big time saver for Exalto Bearings as we produce bearings to sizes across both measuring systems. The gauges also allow us to store two nominal sizes at once, enabling us to measure two different batches of bearings without re-setting the gauge. Again, this saves us time and makes our whole process more efficient.